The press secretary said the president's devotion to so-called religious liberties extends to businesses hanging signs about refusing service to LGBT people. 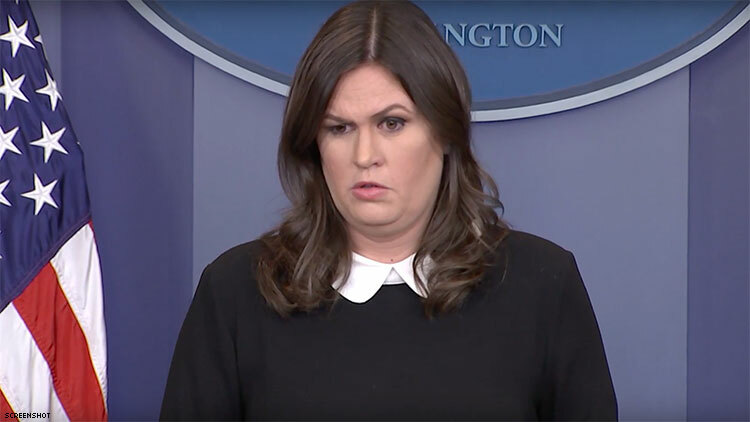 President Trump's press secretary said her boss would have no problem with businesses hanging antigay signs that explicitly state they don't serve LGBT customers. Hours after oral arguments concluded in the Masterpiece Cakeshop case — where a Colorado baker argued to the Supreme Court that his religion allows him to refuse service to gay people — press secretary Sarah Huckabee Sanders was confronted on legalized discrmination during today's White House press briefing. "The lawyer for the solicitor general's office for the administration said today in the Supreme Court if it would be legal, possible for a baker to put a sign in his window saying we don't bake cakes for gay weddings," The New York Timess Michael Shear asked. "Does the president agree that that would be OK?" "The president certainly supports religious liberty and that's something he talked about during the campaign and has upheld since taking office," Sanders replied. When pressed on whether that included support for signs that deny service to gay people, Sanders responded, "I believe that would include that."